A year ago… a ruptured pipeline spewed more than 840,000 gallons of tar sands oil into the Kalamazoo River. It’s definitely been a buyers’ market for Enbridge. Eventually, Enbridge bought the Groths’ home… and has bought or is buying another 137 homes in the spill zone. Enbridge has not only been buying homes. It’s also been settling claims with hundreds of people affected by the spill in other ways. Jason Manshum is an Enbridge spokesman. He says the pace of damages claims against Enbridge that was once a torrent has slowed to a trickle. Enbridge has settled more than 2300 damage claims. But not everyone is happy with Enbridge’s efforts. Attorney Bill Mayhall represents 16 families that are suing Enbridge. Mayhall says overall, Enbridge has in many instances treated people fairly and compensated them well. But he does have a problem with the damage claim system that the pipeline company set up after the spill. Under the system, people made their damage claims directly to Enbridge. Mayhall says Enbridge was quick to compensate for property damage… but has resisted paying damages for health related claims. An Enbridge spokesman insists the company has settled some claims related to health complaints. Mayhall says his clients will be deposed this week by Enbridge attorneys. He says unless a settlement can be reached in the next few months, their cases may end up going to court… a process that may take years. But for others affected by the spill, their lives have moved on. Wayne Groth is standing on the deck overlooking the backyard of his new home south of Battle Creek. He and his wife Sue moved late in the spring. It’s a lovely home, with only one possible problem. 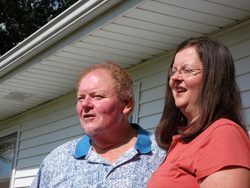 But Wayne and Sue Groth say they’re not worried another pipeline breach could force them out of their home again.